Many rural roadways in Iowa have centerline and/or edgeline pavement markings. The current Manual on Uniform Traffic Control Devices (MUTCD), however, requires centerline and/or edgeline pavement markings only along streets and roadways with traffic volumes much greater than 400 vehicles per day (the volume-based definition of a low-volume roadway in the MUTCD). 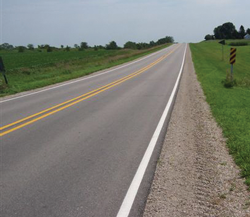 This project was initiated to gather and summarize information about the state of practice related to the installation and maintenance of pavement markings along low-volume rural roadways in Iowa. Additional information was also collected to provide more guidance in the pavement-marking decision-making process. The tasks completed include an examination and summary of past research, the collection of legal input related to the use of pavement markings in Iowa, and a survey of Iowa county engineers that focused on their current pavement-marking practices. A basic safety benefit-cost evaluation of pavement-marking applications was also performed. Overall, the literature on the effectiveness of pavement markings and their safety impacts is limited. A number of studies have been completed with varying levels of robustness and reliability in their results. The Highway Safety Manual includes crash modification factors for the installation of centerline markings that it indicates should be used with caution, and one for the installation of edgeline and centerline markings that equates to a 24 percent total serious and minor-injury crash reduction. A more recent study from Louisiana also found a 15 percent reduction in total crashes after the addition of edgelines. The legal input acquired as part of this project was generally common knowledge. It indicated that once a traffic control device has been installed, the jurisdiction must properly and adequately maintain it. The survey completed found that, of the great majority of the respondents (97 percent), painted centerline/no passing zones and edgelines on at least some of their paved low-volume rural roadways. A much smaller percentage took this approach, or only painted centerlines/no passing zones, along their seal-coated roadways. The basic cost-benefit evaluation found that the percentage of crash reduction needed from pavement markings to make them beneficial was very low (i.e., 5.1 percent, at most). Overall, it was concluded that pavement markings are widely used in Iowa along low-volume paved roadways and sometimes seal-coated roadways. In addition, there is a safety benefit to the installation of pavement markings. but the research into that impact is limited, particularly along low-volume roadways. It is recommended that further analysis be completed on potential pavement-marking safety impacts, that a pavement-marking database be developed, and that a committee be initiated to help develop policies related to pavement-marking removal.